Mostly Physically Handy-capped people always face trouble in moving from one place to another place. 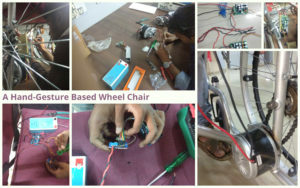 Through this project, community and school students at Atal TInkering Lab, Choithram School, Manik Bagh, tried to create a unique wheelchair which can be controlled with the Wrist movements using an accelerometer. People with physical disabilities every time find it complicated to navigate through their house without the assistance of someone. But to navigate through one’s own home without contributing to anyone all time can be demoralizing for the person as well. It can be handled wirelessly with hand gesture methods. The system consists of the development of wheelchair control. It is useful for the physically disabled person with his hand movement with the help of hand gesture recognition. The system is classified into a gesture unit and wheelchair unit. This wheelchair can be controlled by simple hand gestures. It consists of an Accelerometer sensor which controls the wheelchair hand gesture made by the users and clarifies the motion consist of user and moves accordingly. When we changed the ways, the sensor registers values are changed & that values are given to micro-controller. Depending on the direction of the Accelerometer controls the wheelchair ways like LEFT, RIGHT, FORWARD, & BACKWARD. The purpose of this system is to implement wheelchair direction control with hand gesture reorganization.